The Holiday season is underway, and the hustling and bustling has begun. In the midst of your family’s concerts, plays, and parties, I want to encourage you to slow down and hang out in the kitchen with your kids. To help you with this, throughout December we will be collecting seasonal recipes from cooks across Nashville to share with you. These are all dishes to help you celebrate, and help you include the kiddos in the fun of cooking and baking this holiday season. To kick us off, author and certified holistic chef, Laura Lea, has shared her recipe for Gingerbread Rolls with Pecan Vanilla Frosting. From Laura Lea: I love this dish, because it’s a hybrid of scratch-cooking and one of my favorite companies that is now available in most grocery stores and online—Simple Mills! Simple Mills makes healthier cake mixes, frosting, cookies, crackers and more, so I am always looking to share about them with moms and families! This roll is a blast to make, and it’s still delicious even if it gets some cracks and breaks along the way. It’s a treat for a holiday morning breakfast, and of course, you can also enjoy it as dessert! Preheat oven to 350 and line an 18 x 13″ baking sheet with nonstick parchment paper, allowing an inch or so to overhang length-wise. Grease evenly with a teaspoon or two avocado oil. In a medium mixing bowl, whisk together remaining 1/3 cup avocado oil, eggs, coconut milk, molasses and vanilla extract. In a large mixing bowl, add Simple Mills Vanilla Cupcake & Cake Mix, cinnamon, nutmeg, and ginger. Whisk to combine. Add wet ingredients to dry and mix until thoroughly incorporated. Spread batter onto baking sheet in an even layer. Bake for 20 minutes, or until the center is springy when touched lightly and doesn’t leave batter on your finger. *Keep the oven on 350. Allow to cool 10 minutes. Gently roll up the cake, starting from one of the shorter sides. It’s ok if you see a few little tears. Refrigerate roll on baking sheet for 30 minutes. While cake is cooling, add pecans to a baking sheet and roast for 8 minutes, or until fragrant and slightly darkened in color. Allow to cool 10 minutes, then chop finely into small pieces. Add pecans to a mixing bowl, and stir in the container of Simple Mills Vanilla Frosting. Remove cake from the fridge and carefully unroll. Spread cake with pecan frosting in an even layer, then gently roll up again, this time without the parchment paper (gently remove as you roll). Refrigerate at least 1 more hour before slicing and serving. Store leftovers (if any!) in an airtight, glass container for maximum freshness. Roll will keep for 5 days in the refrigerator. ***NOTE: Because there is coconut oil in the frosting, it will be hard right out of the fridge. 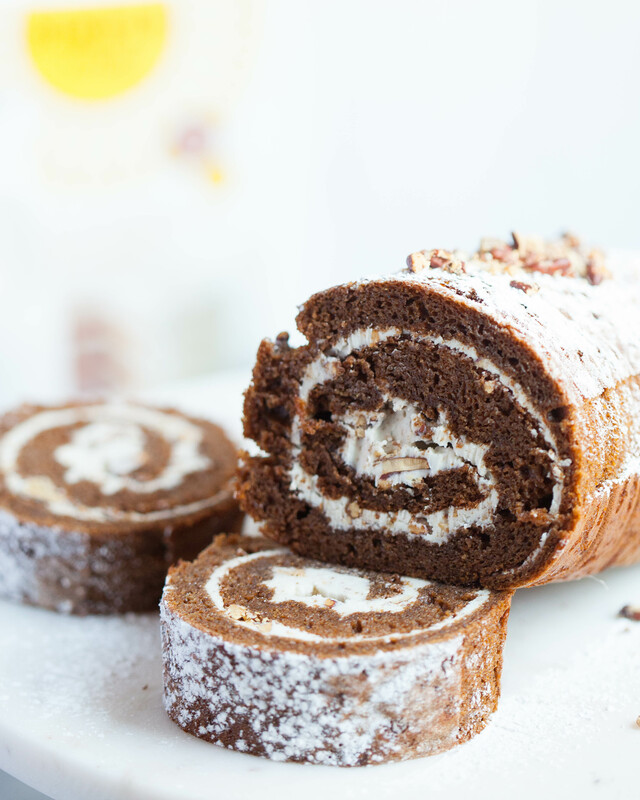 Allow roll to come to room temperature before serving, so the frosting is soft (time will depend on the room). NOTE: Laura Lea says Simple Mills is available at Whole Foods, Publix, Sprouts, on Amazon, iHerb, or Thrive Market. You can also sub regular boxed cake mix and frosting . You can sub full-fat dairy milk for coconut milk, and you can sub canola oil or melted butter for avocado oil!